Proprietary Name: Varizig What is the Proprietary Name? Non-Proprietary Name: Varicella Zoster Immune Globulin (human) What is the Non-Proprietary Name? Varizig with NDC 70257-126 is a a human prescription drug product labeled by Saol Therapeutics Inc.. 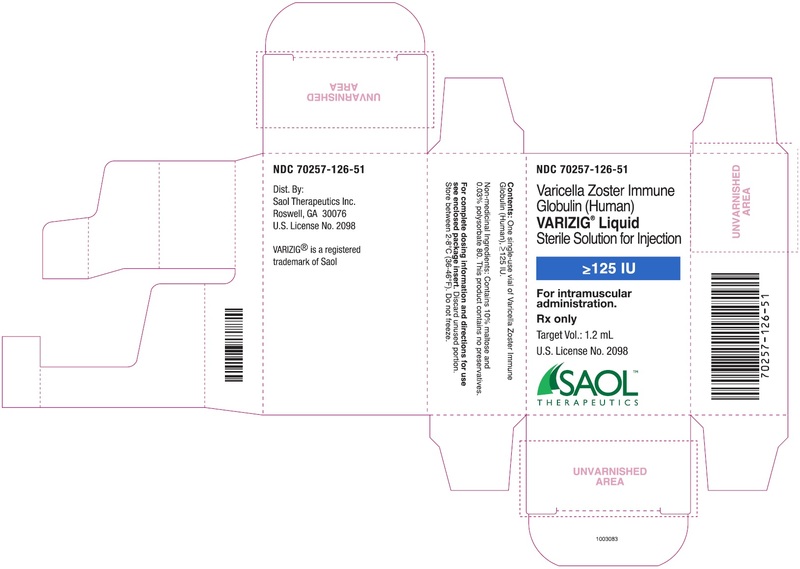 The generic name of Varizig is varicella zoster immune globulin (human). The product's dosage form is solution and is administered via intramuscular form. FDA Application Number: BLA125430 What is the FDA Application Number? VARIZIG® [Varicella Zoster Immune Globulin (Human)] is indicated for post-exposure prophylaxis of varicella in high risk individuals. High risk groups include:immunocompromised children and adults,newborns of mothers with varicella shortly before or after delivery, premature infants,neonates and infants less than one year of age, adults without evidence of immunity, pregnant women. VARIZIG administration is intended to reduce the severity of varicella. Administer VARIZIG as soon as possible following varicella zoster virus (VZV) exposure, ideally within 96 hours for greatest effectiveness. There is no convincing evidence that VARIZIG reduces the incidence of chickenpox infection after exposure to VZV.There is no convincing evidence that established infections with VZV can be modified by VARIZIG administration. There is no indication for the prophylactic use of VARIZIG in immunodeficient children or adults when there is a past history of varicella, unless the patient is undergoing bone marrow transplantation. Each vial of VARIZIG contains a minimum potency of 125 IU in 1.2 mL. Bring VARIZIG to room temperature prior to use.Inspect VARIZIG for particulate matter and discoloration prior to administration. Do not use if the solution is cloudy or contains particulates.VARIZIG is for single use only. Discard any unused portion.Dosing of VARIZIG is based on body weight. Administer a single dose of VARIZIG intramuscularly as recommended in Table 1. The minimum dose is 62.5 International Units (IU) for small infants under two kilograms body weight; the maximum dose of 625 IU should be administered for all patients greater than 40 kilograms in weight.Table 1 VARIZIG Dose and Volume of Administration*Extractable volumes are confirmed using a 21 gauge needle as per USP General Chapters <1> Injections.Weight of PatientVARIZIG DoseVolume to Administer* (milliliters)KilogramsPoundsIUNumber of Vials≤2.0≤4.462.50.50.62.1–10.04.5–22.012511.210.1–20.022.1–44.025022.420.1–30.044.1–66.037533.630.1–40.066.1–88.050044.8≥40.1≥88.162556.0Consider a second full dose of VARIZIG for high risk patients who have additional exposures to varicella greater than three weeks after initial VARIZIG administration. For intramuscular use only. Divide the intramuscular dose and administer in two or more injection sites, depending on patient size. Do not exceed 3 milliliters per injection site. Inject into the deltoid muscle or the anterolateral aspects of the upper thigh. Due to the risk of sciatic nerve injury, do not use the gluteal region as a routine injection site. If the gluteal region is used, only use the upper, outer quadrant.To prevent the transmission of infectious agents from one person to another, use a new disposable sterile syringe and needle for each individual patient. Individuals known to have anaphylactic or severe systemic (hypersensitivity) reactions to human immune globulin preparations should not receive VARIZIG.IgA-deficient patients with antibodies against IgA and a history of hypersensitivity may have an anaphylactoid reaction.VARIZIG contains less than 40 micrograms per milliliter of IgA. Thrombotic events may occur during or following treatment with immune globulin products (1, 2, 3). Patients at risk include those with a history of atherosclerosis, multiple cardiovascular risk factors, advanced age, impaired cardiac output, coagulation disorders, prolonged periods of immobilization, and/or known/suspected hyperviscosity. Consider baseline assessment of blood viscosity in patients at risk for hyperviscosity including those with cryoglobulins, fasting chylomicronemia/markedly high triacylglycerols (triglycerides), or monoclonal gammopathies. Severe hypersensitivity reactions may occur following VARIZIG administration. Administer VARIZIG in a setting with appropriate equipment, medication and personnel trained in the management of hypersensitivity, anaphylaxis and shock. In the case of hypersensitivity, discontinue administration of VARIZIG immediately and provide appropriate treatment.VARIZIG contains trace amounts of IgA (less than 40 micrograms per milliliter). Patients with known antibodies to IgA have a greater risk of severe hypersensitivity and anaphylactic reactions. VARIZIG is contraindicated in IgA deficient patients with antibodies against IgA and history of hypersensitivity reactions [see 4 CONTRAINDICATIONS]. Because VARIZIG is made from human plasma, it may carry a risk of transmitting infectious agents, e.g., viruses, the variant Creutzfeldt-Jakob disease (vCJD) agent and, theoretically, the Creutzfeldt-Jakob disease (CJD) agent. The plasma donors are screened for the presence of certain infectious agents and the manufacturing process for VARIZIG includes measures to inactivate and remove certain viruses [see 11 DESCRIPTION]. Despite these measures, products derived from human plasma can still potentially transmit diseases. No cases of transmission of viral diseases, vCJD or CJD have been associated with the use of VARIZIG. Report all infections thought by a physician to have been transmitted by VARIZIG to Saol Therapeutics at 1-833-644-4216. Discuss the risks and benefits of this product with the patient before administering it to the patient [see 17 PATIENT COUNSELING INFORMATION]. The most serious adverse drug reactions observed in clinical trials for all subjects and patients (n=601) include pyrexia, nausea, and vomiting.The most common adverse drug reactions (reported by ≥ 1% of subjects) observed in clinical trials for all subjects and patients (n=601) are the following:injection site pain (3%), headache (2%),rash (including terms pruritus, rash, rash erythematous, rash vesicular and urticaria) (1%),fatigue (1%),chills (1%),nausea (1%).All other adverse drug reactions occurred in less than 1%. Because clinical trials are conducted under widely varying conditions, adverse reaction rates observed in the clinical trials of a drug cannot be directly compared to rates in the clinical trials of another drug and may not reflect the rates observed in practice.Six hundred and one (n=601) high risk individuals received VARIZIG intramuscularly in two clinical trials which included pregnant women, infants and immunocompromised pediatric and adult patients. The highest incidence of adverse reactions occurred in pregnant women (n=166), including injection site pain (7%), rash (including terms pruritus, rash, rash erythematous, and rash vesicular) (4%), headache (3%), and fatigue (2%). All other adverse reactions occurred in 1% or less of clinical trial subjects within each high risk group. A single incidence of serum sickness (approximately one in 600 patients treated with VARIZIG) was observed in an immunocompromised adolescent patient. There were eight reported adverse events associated with the coagulation system including, deep vein thrombosis (n=1), disseminated intravascular coagulation (n=1) , intracranial hemorrhage (n=2), coagulopathy (n=2), intraventricular hemorrhage (n=1), and pulmonary hemorrhage (n=1) in 621 subjects in the open-label, Expanded Access Protocol (EAP); the study was not designed to differentiate between adverse events attributed to the underlying medical condition and adverse reactions to VARIZIG. The passive transfer of antibodies with immune globulin administration may impair the efficacy of live attenuated virus vaccines such as measles, rubella, mumps and varicella. Defer vaccination with live virus vaccines until approximately three months after VARIZIG administration. Inform the immunizing physician of recent therapy with VARIZIG so that appropriate measures can be taken [see 17 PATIENT COUNSELING INFORMATION]. Pregnancy category C. Animal reproduction studies have not been conducted with VARIZIG. It also is not known whether VARIZIG can cause fetal harm when administered to a pregnant woman or can affect reproduction capacity. VARIZIG should be given to a pregnant woman only if clearly needed. The safety and effectiveness of VARIZIG have been evaluated for post-exposure prophylaxis in clinical trials in 166 pregnant women [see 6 ADVERSE REACTIONS and 14 CLINICAL STUDIES]. The dosing recommendations in the treatment of pediatric patients are by body weight [see 2 DOSAGE AND ADMINISTRATION]. The safety and effectiveness of VARIZIG have been evaluated for post-exposure prophylaxis in the VARIZIG expanded access clinical trial in 374 pediatric patients, including immunocompromised pediatric patients: 94 preterm newborns and infants,53 term newborns,45 infants and toddlers,176 children and,43 adolescents.In the EAP, follow up data were available for 110 VARIZIG treatments in infants (including newborns, pre-term infants, and infants <1 year old). Three severe infections were reported, all three with pox count >100, one of which also had pneumonia and another one also developed probable varicella encephalitis. Clinical studies of VARIZIG administered intramuscularly for post-exposure prophylaxis did not include sufficient numbers of geriatric subjects (aged 65 and over) to determine whether they respond differently from younger subjects. Use caution when administering VARIZIG to patients age 65 and over who are judged to be at increased risk of thrombotic events [see 5 WARNINGS AND PRECAUTIONS]. Do not exceed recommended doses and administer VARIZIG intramuscularly only. A randomized, open-label, multicenter, active controlled clinical trial was conducted in 60 pregnant women without immunity to VZV as confirmed by a latex agglutination test. Patients were stratified on the basis of time from first exposure to varicella as follows:one to four days post-exposure and, five to 14 days post-exposure.The women were randomized into one of three study arms as follows:a single intravenous dose of 125 IU/10 kg body weight to a maximum dose of 625 IU of VARIZIG,a single intramuscular dose of 125 IU/10 kg body weight to a maximum dose of 625 IU of VARIZIG or,a single intramuscular dose of 125 IU/10 kg body weight to a maximum dose of 625 IU of VZIG (licensed comparator product).Patients were followed for 42 days. Incidence of clinical varicella was similar across all treatment groups with an overall incidence of 33%; however, in the subset of 28 subjects with more than 24 hours exposure to varicella, the incidence of clinical varicella in the combined treatment groups was 64%.Mean weighted constitutional illness scores (CIS) (6) were similar across all groups and none of the subjects had serious complications of varicella. The small number of subjects in each treatment stratum and the lack of agreed upon pre-specified hypothesis testing precluded formal statistical comparisons between groups. Dalakas MC. High-dose intravenous immunoglobulin and serum viscosity: risk of precipitating thromboembolic events. Neurology. 1994; 44:223-6. Woodruff RK, Grigg AP, Firkin FC, Smith IL. Fatal thrombotic events during treatment of autoimmune thrombocytopenia with intravenous immunoglobulin in elderly patients. Lancet. 1986; 2:217-8. Wolberg AS, Kon RH, Monroe DM, Hoffman M. Coagulation factor XI is a contaminant in intravenous immunoglobulin preparations. Am J Hematol. 2000; 65:30-4.Josephson C, Nuss R, Jacobson L, Hacker MR, Murphy J, Weinberg A et al. The Varicella-Autoantibody Syndrome. Pediatr Res. 2001; 50:345-52.CDC. Prevention of varicella. Recommendations of the Advisory Committee on Immunization Practices (ACIP). MMWR. 2007; 56(No. RR-4):1-30.Koren G, Money D, Boucher M, Aoki F, Petric M, Innocencion G et al. Serum concentrations, efficacy, and safety of a new, intravenously administered varicella zoster immune globulin in pregnant women. J Clin Pharmacol. 2002; 42(3):267-74. NDC 70257-126-51: VARIZIG [Varicella Zoster Immune Globulin (Human)] is supplied as a sterile liquid approximately 125 IU of anti-VZV in a 3 mL type 1 glass tubing vial fitted with a 13 mm rubber stopper and a 13 mm flip-off seal, and a package insert.